Ford’s new, fourth-generation Expedition is going to be made of boron steel and aluminum, built on a modified half-ton F150 chassis, and, according to these Ford videos posted here, will look like this. Looks like our predictions that the new Expedition will share a face with the F-150 were completely, utterly wrong. To be honest, I’m happy about that. 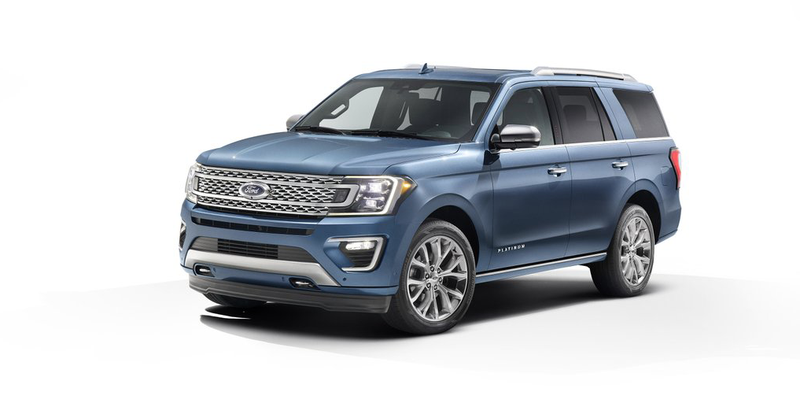 I think the face Ford went with for the Expedition is much more attractive than the F-150 face, which is sort of labored and over-complicated, with all kinds of perforations and bars and vents and headlights shaped like robot claws. The new Expedition face I think actually feels more derived from the Ford Flex, with the inset center bar that intrudes into the headlight area. The intersection of which forms the indicator. It’s handsome, though overall a bit bland. Aluminum favors large, flatter areas so the slab-sidedness isn’t too much of a surprise. They did manage to make it look a bit less tail-heavy than the outgoing design, too. Technically, these images were supposed to be embargoed until noon, but I guess our pals at Truck Trend just got a little excited. That’s okay. Embargoes are sort of stupid, anyway. Inside, we see that Ford’s love affair with diamond-quilted stitching continues unabated, and gear shifting via knob gains yet another adherent. Overall, this is a safe approach for Ford; handsome, but not so distinctive as to make anyone uncomfortable. You can still lose it just fine in a crowded mall parking lot among any number of other almost indistinguishable SUVs from 100 yards away or so, so don’t worry. The 2018 Ford EcoSport: Will This European Micro-SUV Work In America?